The speed, convenience and control of NFC have made it a clear winner with the American public in a study conducted by Strategy Analytics for the NFC Forum. “Once you get the technology into the hands of the consumer and allow them to experience it firsthand, NFC is preferred far away and above competing technologies,” analyst Christopher Dodge has told NFC World. More than 75% of the US consumers who participated in the study were “very satisfied with their experience” of NFC compared to a 53% satisfaction rate for QR codes. 50% preferred using NFC to retrieve information on related products compared to QR codes with 23% and Bluetooth beacons with 10%. 56% also preferred using NFC to access information on large products compared to QR codes with 23% and Bluetooth beacons with 7%. 61% preferred ordering parts and accessories for products using NFC rather than QR codes (20%) and 43% preferred using NFC as a means of accessing in-store Wi-Fi as well as to view deals and rewards over QR codes (25%) and Bluetooth beacons (14%). 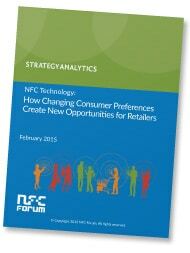 WINNING TECHNOLOGY: Research finds NFC leads in every category. Click to enlarge. “It is about convenience,” Dodge explained. “One of the big things is not having to launch an app to use NFC. If we think about the Bluetooth beacon aspect, one of the biggest issues for the participants in the study was the fact that the information was pushed to them, which essentially took away their control. “I think one of the clear takeaways from this study is that NFC is a great technology to deploy now for a large number of these value-added services,” adds Matthew Bright, chairman of the retailing working group at The NFC Forum. “Within the retail environment, there’s room for many technologies. Retail environments are diverse and a wide variety of technologies may be appropriate in different cases. “There’s a couple of major points that make now a particularly attractive time for retailers to look at NFC for some of these use cases beyond payments. 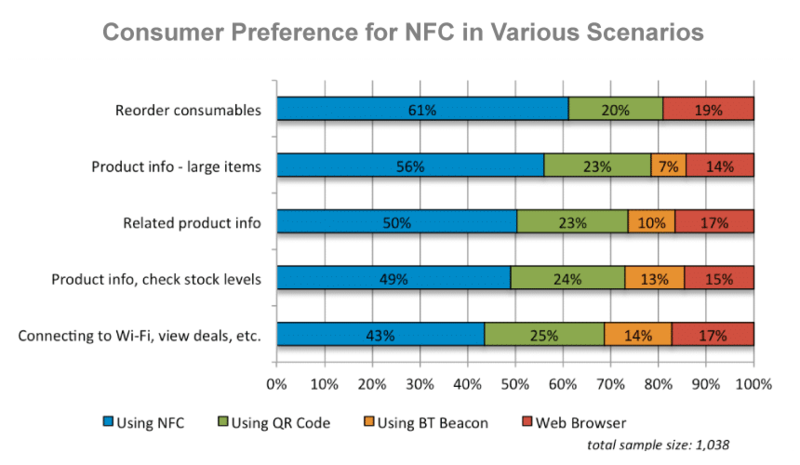 Simpler, more convenient, faster and better control over the interaction are all factors that lead consumers in this study to indicate to Strategy Analytics that NFC was the preferred technology. 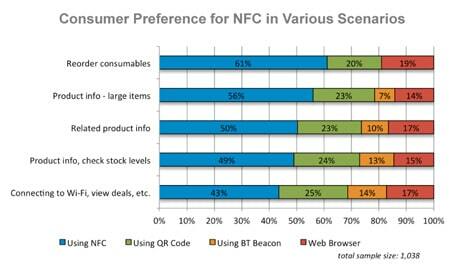 • “NFC technology: How changing consumer preferences create new opportunities for retailers” can be downloaded free of charge from the NFC World+ Knowledge Centre.